HARARE, Aug 4 2014 (IPS) - Millicent Gananda, 34, and her two children enjoy their food at a roadside restaurant in downtown Harare, Zimbabwe’s capital, before they dash into the supermarket next door. “I can only afford to [buy what is on this] list after almost three months [of saving] because life is hard these days,” Gananda tells IPS as she later emerges laden with groceries to take home. Gananda, a teacher at a government school, says she can’t afford anything except basic foodstuffs for her family amid a failing economy in this southern African nation. Gananda is not the only one here solely able to purchase just food these days. “Feeding my family has become priority number one as times become tougher and tougher here,” Adious Matutu, a married man and father of five from Zimbabwe’s Gweru town in the Midlands Province, 277 kms west of Harare, tells IPS. Shupikai Chipunza owns an informal grocery shop in Harare. And while may others are being affected by the economic downturn, her business is doing well. “I take home over 1,300 dollars daily in sales as people buy groceries from my shop here. It is a trend that has gone up this year because people are concentrating on feeding themselves, setting aside other needs that have nothing to do with keeping them alive,” Chipunza tells IPS. As hundreds of industries shut down across Zimbabwe, there has been an increase in the number of food outlets that are opening. A 2013 National Social Security Authority Harare Regional Employer Closures and Registrations Report for July 2011 to July 2013 says 711 companies in Harare closed down during this time, rendering 8,336 individuals jobless. 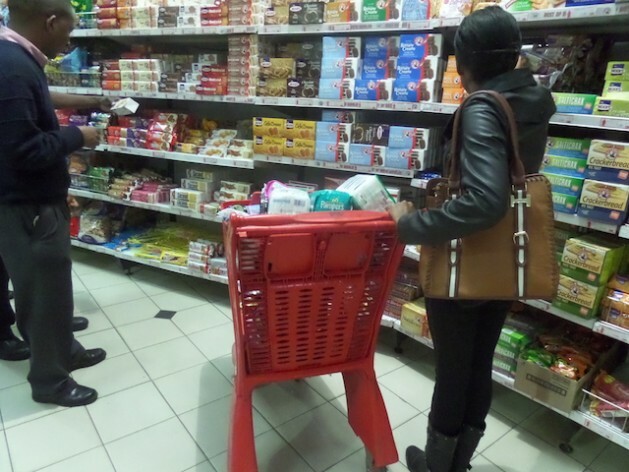 But statistics released this year by the Indigenous Food Processors Association, an independent organisation made up of local Zimbabwean food entrepreneurs, show that 70 food shops, either supermarkets or retail stores, are opening monthly nationwide. This appears to be an increase from last year. According to statistics released by the Zimbabwe National Statistics Agency (ZimStat) in 2013, 26 food outlets, including both formal and informal restaurants and grocery stores, opened every three months, countrywide. The Confederation of Zimbabwe Industries, an organisation which develops and monitors business activities here, admitted earlier this year that industries were in a comatose state — save for the food business. Clothing supermarket chain, Greatermans, shut down operations on Jun. 30, paving the way for South Africa’s giant food supermarket, Pick ’n Pay. American fast food chain KFC reopened in Zimbabwe this year after seven years of absence. KFC turned its back on this southern African nation at the height of the economic crisis in 2007. Economists say the current situation is a result of survival. “Although people are saving so hard the little money they are getting amid the worsening liquidity crunch here, it is towards food that they now channel that hard-earned money,” independent economist Kingston Nyakurukwa tells IPS. An average urban Zimbabwean family of six earns about 564 dollars monthly, according to the Consumer Council of Zimbabwe (CCZ). “[It] is giving an advantage to the food business community here and as more and more people direct their little earnings towards merely putting food on their tables, it renders business opportunities to entrepreneurs who are now daily shifting focus to dealing in food items,” adds Nyakurukwa. Meanwhile, food entrepreneurs like 37-year-old Agnes Madzore are smiling all the way to the bank. “My restaurant here is giving me more money than the clothing shops that I operate,” Madzore tells IPS, adding that her restaurant makes 285 dollars a day. And Chipunza says her venture continues to thrive against all odds. “With more people opting to focus on feeding themselves ahead of all other priorities here despite our country experiencing serious economic challenges, ventures in food businesses are paying back indeed,” she says.